Home → News → Too Cold to Walk? Try Indoor Walking! Too Cold to Walk? Try Indoor Walking! The winter cold is upon us, but that doesn’t mean you have to give up your walking routine. 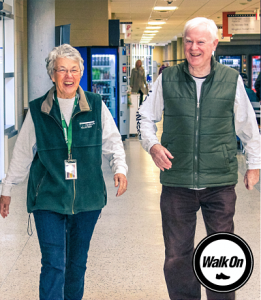 Walk On is a FREE, drop-in, indoor walking program offered at six locations in KFL&A. Walk On provides a safe, social, and accessible environment for people of all ages and abilities to walk indoors. Trained volunteers are on site to lead walks. For more information or the full schedule, please call 613-549-1232, ext. 1180, or visit www.kflaph.ca/WalkOn.